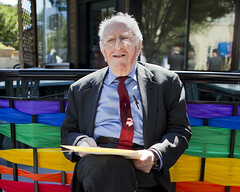 Some sad news this evening, gay rights pioneer Dr. Frank Kameny has passed away at his DC home at the age of 86. Natural causes as presumed at this time. Kameny, then an astronomer with the Army Map Service, filed what is believed to be the first civil rights case for his dismissal by the Army over his homosexuality. He took his case before the highest court in the land in 1961, only to be denied justice. Kameny became a crusader for equal rights, fighting for those who had their security clearances revoked, their lives ruined, by an aggressive policy in the government against gays. In 2009, Kameny finally received the apology that he was due back in 1957, courtesy of the director of OPM under the Obama administration. The intersection of 17th & R Streets NW was dedicated to Kameny in June of last year. Kameny was a stalwart figure, who stood up for his rights, and the rights of others who were being marginalized. It is a sad end to National Coming Out Day, and we stand with the LGBTQ community in honoring Kameny’s legacy.